Activists call for mass-protests after police say Judaism's holiest site will be closed to Jews at least until after Ramadan, on August 11. In an "unprecedented" move, police on Wednesday informed Jewish groups that the Temple Mount will be closed to all non-Muslims until at least the end of Ramadan, on 11th August. 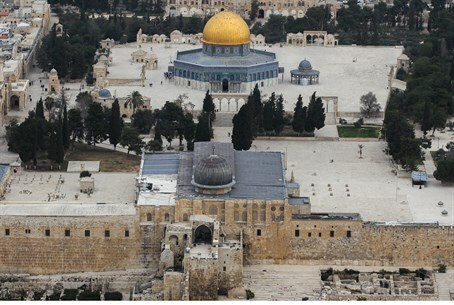 The announcement has provoked renewed anger over anti-Jewish discrimination on the Temple Mount, and sparked calls by activists for a mass-protest on 7th August, at the start of the Hebrew month of Elul. Temple Mount activists had complained that for the past three days the Temple Mount - the holiest place in Judaism - remained inexplicably closed to non-Muslim visitors. The only "explanation" offered was a bland sign which simply read "Today the Temple Mount will be closed to visitors." On Wednesday, Police Commander Avi Bitton finally informed representatives of the Organisation of Temple Movements - an umbrella of various Temple Mount groups - that the sign would remain up for at least another two weeks, until after the Muslim festival of "Eid", which marks the end of Ramadan. Since the beginning of Ramadan, Islamists have upped their campaign to prevent Jews from setting foot on the Temple Mount - let alone praying there. On the eve of the 9th of Av - the Jewish day of mourning over the destruction of the Holy Temples - a group of Jews including Deputy Foreign Minister Ze'ev Elkin were driven off the Mount by a mob of Muslim extremists. “Now it turns out that the police have collapsed completely in their mission, and have failed in their effort to keep order on the Temple Mount." “All of these [closures of the Temple Mount] were illegal actions taken by police, violating freedom of access to holy places," he said. The Temple Mount is Judaism's holiest site, where the two holy Temples once stood before being destroyed by the Babylonian and Roman empires respectively. Despite its supreme importance to Jews worldwide, Jewish visitors are subject to draconian restrictions on the Mount, including a ban on praying, due to the presence of an Islamic complex, administered by the Waqf Islamic Trust, and amid threats by Islamist groups. The Israeli police have bypassed several court decisions upholding the Jewish right to prayer there by citing unspecified "security concerns", either to ban individual activists or even to issue blanket prohibitions on Jews ascending at all. Religious Jews are followed closely by Israeli police and Waqf guards to prevent them from praying, or from carrying out any other religious rituals. Non-Jewish visitors are not subject to such restrictions. But Wednesday's decision to close the Mount for such a prolonged period of time is "unprecedented," according to Rabbi Chaim Richman of the Temple Institute. "This sets a new and dangerous precedent," warned Rabbi Richman. "Over the past few weeks there have been several attacks by Muslim extremists on the Temple Mount, and the police have aided and abetted them by standing by and allowing our rights to be violated. Even the Deputy Foreign Minister was not granted the right to freedom of worship." Rabbi Richman accused the government of having "surrendered sovereignty over the Temple Mount." "By granting the Jordanian-run Waqf free reign on the site, even aquiessing to their demands to ban Jews from ascending, the State of Israel has effectively abandoned the Temple Mount altogether. "No matter what posturing the government performs, and no matter how many times they repeat the meaningless mantra that 'The Temple Mount is in our hands' [a reference to the famous declaration made after the liberation of Jerusalem in 1967 - ed. ], the fact is that the Temple Mount is actually in the hands of the Waqf and the Jordanian government." The Organization of Temple Movements is taking this latest development very seriously, viewing it as a "test balloon" as to how the Israeli public - and wider Jewish public - will respond. "This week we commemorated the 10th anniversary of the reopening of the Temple Mount to Jews, after it was closed for three years following the outbreak of the Arab intifada," said Rabbi Richman. "During those three years of abandonment the Waqf took the opportunity to destroy countless precious artifacts in an attempt to erase the Jewish connection to the Mount. "It is truly tragic that the government has chosen to mark this occasion by once again imposing an extended ban on Jewish ascents. "If this situation passes quietly, we will have reached a point of no return. The police are testing the waters: how important is the Temple Mount to the Jewish public? Our message - and the message of Jews around the world - must be clear: the Temple Mount is the heart and soul of the Jewish people, and we will not abandon it again."